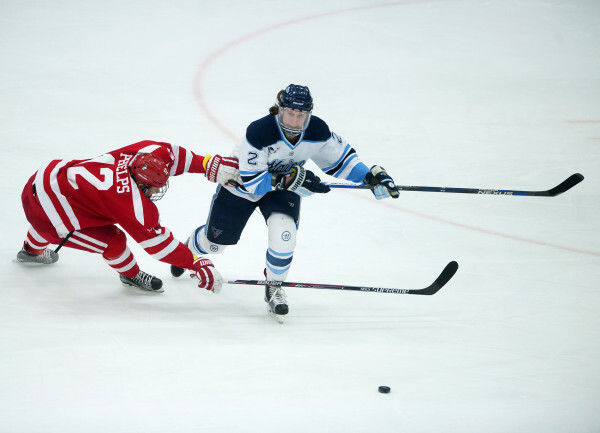 University of Maine's Dan Renouf (right) battles for a loose puck with Boston University's Chase Phelps during their hockey game at Alfond Arena in Orono in this January 2016 file photo. The University of Maine athletic department followed through on its desire to submit a bid to the NCAA to host a Division I hockey regional at Portland’s Cross Insurance Arena last week, but the earliest it could land a regional would be the 2019-20 season. UMaine has partnered with the Maine Sports Commission on the bid. He said the fate of UMaine’s bid will be known in December. Bids were received by the NCAA starting with the 2017-18 season, but the Black Bear program has been in a downward spiral for several years, and it would certainly be better for attendance if UMaine was a participant in a Portland regional. By pushing back the bid until the 2019-20 season, it provides more time to rebuild the program into a legitimate NCAA tournament contender again. UMaine has won NCAA championships in 1993 and 1999. The NCAA sends teams to regionals they are hosting as long as they qualify. UMaine has gone 49-80-21 over the past four seasons and has missed the NCAA tournament eight times in the last nine years after putting together a string of nine consecutive berths. Woodcock said the break-even number outlined by the NCAA for hosting a regional is $150,000. “If we don’t reach $150,000 in revenue, we’d be on the hook for the remainder of the money. But I don’t anticipate that being a problem,” said Woodcock. UMaine has never hosted an NCAA hockey regional. It submitted an unsuccessful bid to host one in Portland about 2003. But the former Cumberland County Civic Center has undergone a $33 million renovation that was completed in February, 2014, adding 37,408 square feet of space, including several much-needed locker rooms. There are six schools in Hockey East closer to Portland than Orono: Boston is 108 miles from Portland, and there are three Boston schools in the league — Boston College, Boston University and Northeastern; UMass Lowell is 101 miles away; Merrimack College is 87 miles from Portland and the University of New Hampshire is just 61 miles away. It is 137 miles from Orono to Portland. “We realize that the bid process is very competitive but it is exciting to be in the running,” she said. Nee said the commission had an intern from the University of Southern Maine compile a bid book over the summer that chronicled how successful Maine has been at hosting events. “It also took a comprehensive look at all of our hockey programs across the state, the University of Maine’s past successes and how strong the support is for sports in the state,” said Nee. “We wanted to set ourselves apart from the other bidders,” she said. The Black Bear hockey team has been well supported in Portland, drawing an average of 4,955 over its last eight games. The Cross Insurance Arena holds 6,733 for hockey. UMaine opened this past season by hosting the IceBreaker Tournament in Portland involving the University of North Dakota, Michigan State and Lake Superior State as well as Maine. Woodcock said Brad Berry, the head coach of 2016 national champion North Dakota, wrote a letter of support for the regional bid. UMaine will play three regular-season games in Portland this season, including Hockey East matchups against Boston College and Notre Dame. Woodcock said a professor at the university estimated that a hockey game in Portland provides $1 million in revenue for the city and surrounding communities including money spent at hotels, restaurants and stores. “Our athletic department feels very strongly that these are the types of things we want to do as a university and athletic department because they will benefit the whole state,” said Woodcock. “It’s not just about winning hockey games. It’s how can we support the state and the business community and showcase what a great region we live in and play in,” said Biberstein.